Seattle-based cosmetics company Julep is the world’s fastest-growing omnichannel beauty brand. Julep is the only beauty company to develop and produce hundreds of new products each year based on crowdsourced customer feedback gathered through forums and social channels. By infusing “tech startup DNA” with the latest beauty innovations, Julep brings products to market 10X faster than traditional beauty brands. Founded in 2007, CEO Jane Park started Julep out of her passion for female friends and the magic that happens when they create together. Julep’s motto is to empower women to “brave pretty,” or to step outside of their beauty comfort zone and have fun with cosmetics. They are true believers that, “If you can put it on, you can pull it off!” Julep is best known for its Maven Program, a subscription product offering customers the only fully customizable beauty box on the market. Each month, Mavens, or members of the subscription program, log into their Julep account and are able to choose products for their upcoming box. The Maven Program is a fun and affordable way for women to stay up to date on the latest beauty trends, as well as get rst access to site-wide deals and Julep’s new product releases. Julep’s dedication to customer experience allows the brand to nurture and grow an incredibly loyal and passionate customer base. Julep believes that the best way to spread the word about its Maven Program is through existing brand advocates and that the giving them a way to refer their friends easily would increase their participation. To succeed with a referral program, the company focused on making the transition from shopping to sharing seamless for customers. Julep chose Extole as its refer-a-friend provider for its best practices, ease of implementation, and ability to identify Julep’s top advocates. Julep Mavens are incredibly loyal to the brand — they buy more consistently, spend more, and actively engage with the brand on social media. 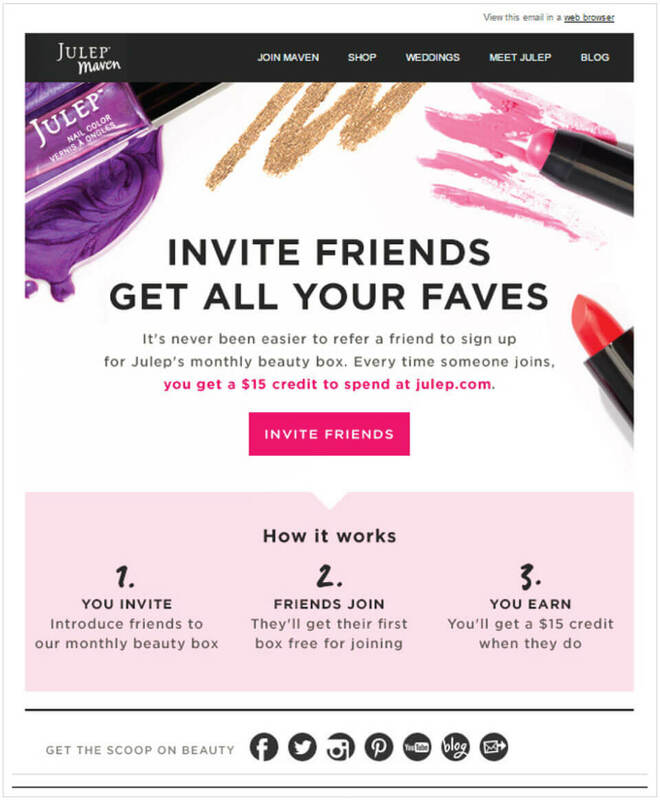 Julep developed a referral reward that it knew would incentivize Mavens to share — a $15 Julep credit when a referred friend joins the Maven Program. Simultaneously, when a referred friend subscribes, she receives her first beauty box for free. 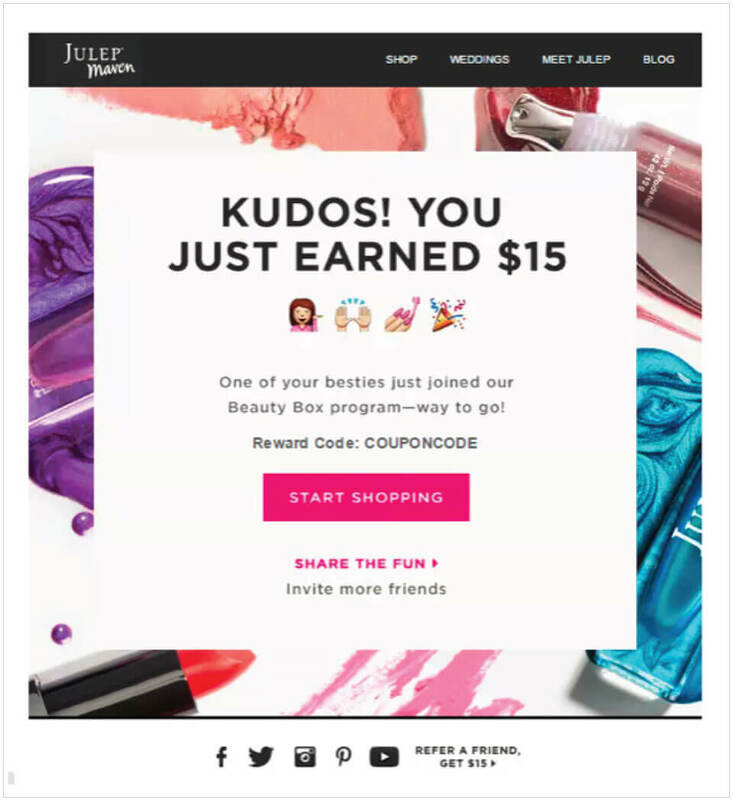 New customers get fabulous products free of charge, advocates get money with which to buy new products, and Julep acquires customers who are primed, through the referral, to buy again and again. 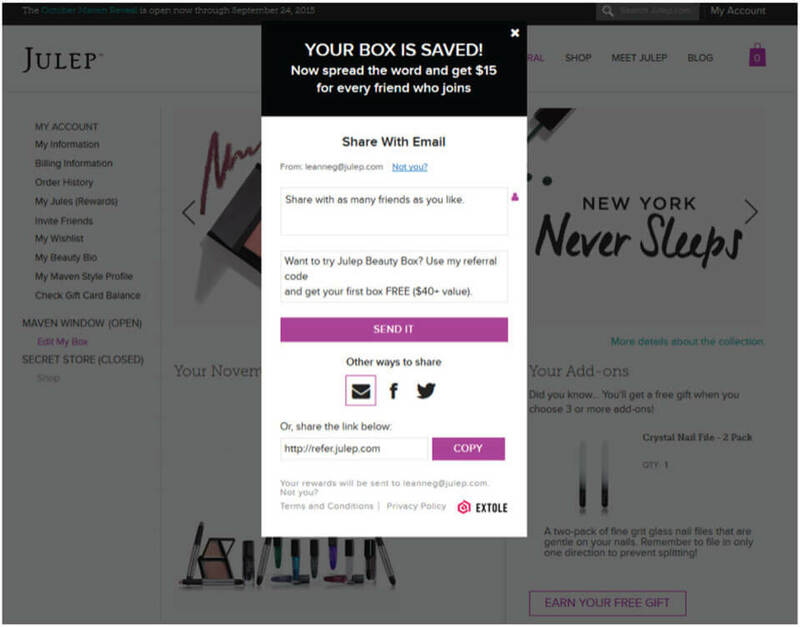 Julep offers easy sharing opportunities at different points during the customer journey to encourage referrals and increase the likelihood of an advocate sharing. The brand offers four standard sharing options through its refer-a-friend program — email, Facebook, Twitter, and personal sharing links. Additionally, Julep believes that the success of its referral program rests heavily on the program’s promotion. Customers can find refer-a-friend promotions on their purchase con rmation page, the “My Account” page, the site when an advocate is logged in, and in well-timed email communications. All sharing options can be customized by advocates, with Julep providing suggested referral messaging. When a friend clicks on a referral link, they visit a customized landing page experience created specifically to recognize the importance of the referral. Additionally, to remind them of their offer, referred friends are invited to take a two minute quiz that helps build their personalized beauty box. Once the referred friend nishes the process and joins the Maven Program, the advocate qualifies for the reward and shortly after receives an email with their $15 credit. 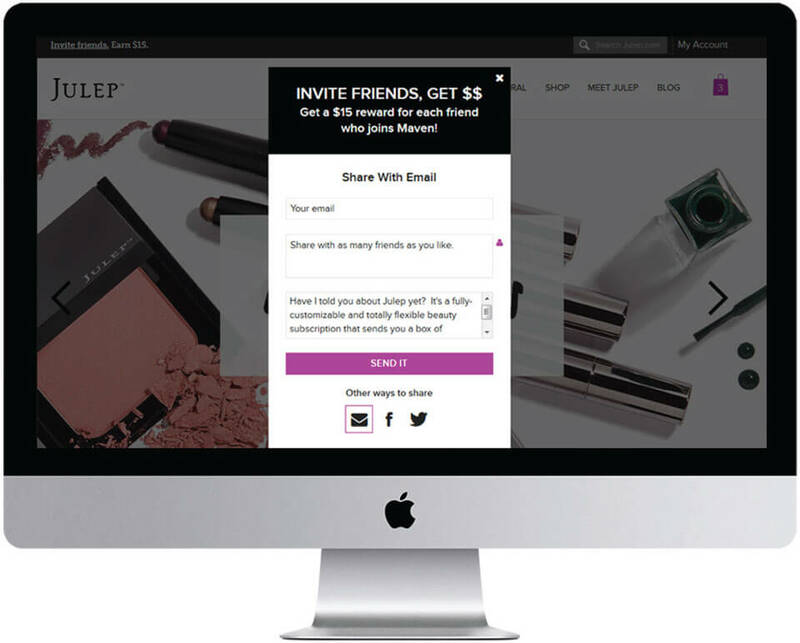 The success of Julep's referral program rests heavily on the program’s promotion. Julep quickly found that though their brand advocates were always interested in spreading the word about Julep, promoting referrals during specific events got the most referrals. One of Julep’s best promotions occurs during the monthly “Pick Your Box” window. Each month, Mavens are prompted via email to log into their account and choose the beauty products they want included in their next box. As soon as they save their choices, a refer-a-friend box pops up and states, “Your box is saved! Now spread the word and get $15 for every friend who joins.” Julep found that during the “Choose Your Box” window, it has 5x the number of shares than on any other day. Another highlight? The sharing during this timeframe is done by Julep’s best customers, making the referrals extremely valuable. Julep also found that the more visual and contextual the referral content, the higher the conversion rate. The brand developed an email template that allows Mavens to send images of recommended products to their friends accompanied by the message, “Your friend thinks you’ll love this (and we do, too! )” Additionally, contextual shares through Facebook and Twitter are high conversion drivers for the brand. 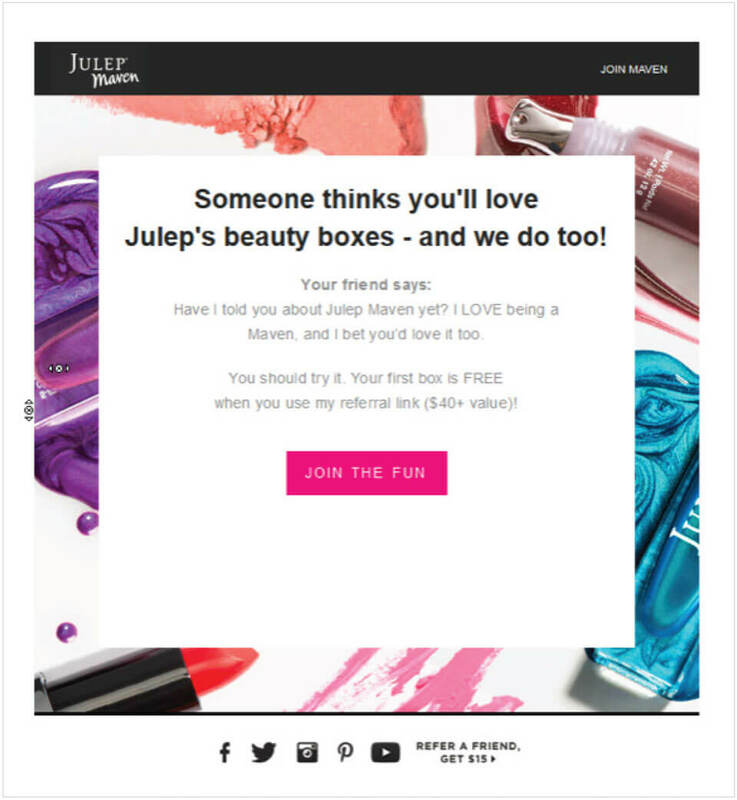 Making these refer-a-friend messages less brand-driven and more personal has increased conversions tenfold for Julep. 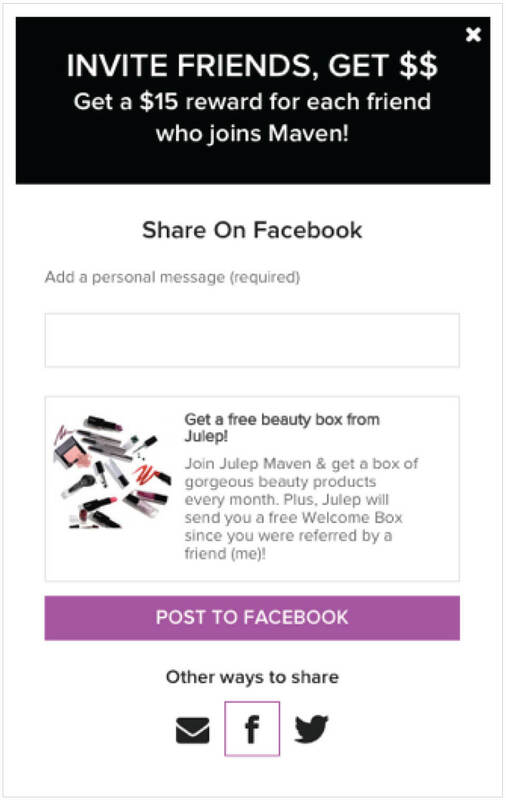 Julep’s referral marketing campaign allows it to reward its best customers for their ongoing dedication to the brand, all while capturing new, loyal customers to expand its customer base. Extole’s platform not only provides Julep a seamless platform through which to drive these referrals, but it also makes it easy for them to reward and recognize right people by giving them visibility into their best customers - those with the most shares, highest revenue, and most conversions. Extole enables Julep to classify top advocates as “VIP Members,” treating them to a heightened level of care and communications and in turn making them more loyal. Extole’s referral platform offers Julep new and exciting ways to engage its current customers while rapidly acquiring new ones, making it an invaluable resource for the brand.